From the contemplative "Coda" to the rock and roll sound of "It's A Murderous Town" and the hoedown-style "Summertime", this debut album presents the spirited voice and mean right hand of Texas singer-songwriter Cat McGee, a sampler of what's yet to come. 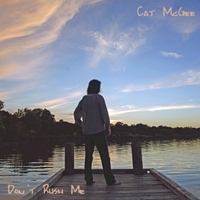 A long time coming, "Don't Rush Me" is an EP with a lot of variety, a sampler of sorts for the debut album of Texas singer-songwriter Cat McGee. It's difficult to pin down the genre of Cat's music. It lies somewhere in the mix of folk, rock, Americana, and country, with maybe a little blues thrown in here and there. Cat's lyrics venture from contemplative and spiritual to whimsical, and her voice has been compared to Natalie Merchant, Joan Armatrading, the Indigo Girls, Tracy Chapman, and even Joni Mitchell on the odd night. Take a listen and decide for yourself. Keep up with Cat at catmcgee.com.